This performance-presentation exhibits ornamenting processes of I/voice/force and becomings between sounding notes/structures/forms. In short: articulating mattering-processes through force and form. Following a transforming web of acts and encounters, desire and urge – becomings of I/voice – are continuously meeting that-which-isn’t-yet-known. The form (or stage) presented, is a landscape and a twisted borderland made up of nomadic theory (Braidotti 2011) and artistic operatic madness (Belgrano 2011). The force is a chorus of intra-active voices mourning the loss of a city, loss of life and loss of trust. Departing from a nomadology illustrated conceptually, politically and contextually by Braidotti, the I/voice/force moves through structures of sound, characters, emotions and statements chanted out of fear and pain. Each vocal sound marks a conclusion and a beginning. Limiting. According to Lacan, limits – being wounds or scars, or marks “of irreplaceable losses as well as liberal thoughts.” According to Deleuze, limits – “points of passages, thresholds, and markers of sustainability” (Braidotti 2011). Limits = Conclusions and Beginnings. What comes in between all limits are transformations, as in complex ecosystems of indeterminable encounters. Everyone being part of such an encounter is being touched by the presence of its in/non/human neighbours. Together they form a world of more-than-human-references. An irrational structure in it’s own becoming. The purpose of this paper is to show how each vocally fragmented ‘conclusion-transformation-beginning’ of a microscopic moment, generates patterns being part of much larger global patterns. Along the way every act and every turn of I/voice/force will, by means of emergent properties, be diffracted and giving birth to multiple voices. One voice will become I-being-more-than-one-voice, trusting in its own ways, colours, shapes, forms, and non/sensical appearances. As a result, this paper calls for further investigation of transformative processes with/out limits, and thus moving towards an Ecology of Trust. 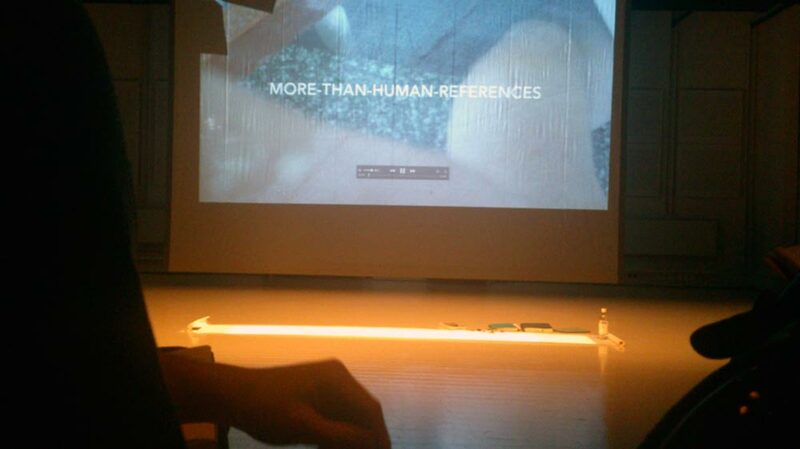 The presentation has been shaped and inspired by a 17th century opera libretto. 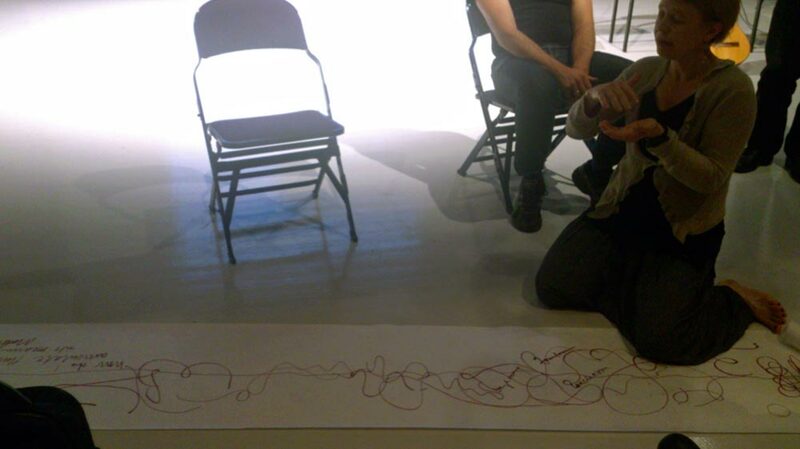 The outcome has been assembled as a dialogue and a drama for Voice/Mind and a Chorus of More-than-Human-References. Each one of these More-than-Human-References serves as another subject entering the thinking process quite unpredicted and spontaneously, rather than being pointed out, referred to, reflected upon and analysed through discourse based on a binary opposition as commonly done in a more scientific/objective and traditional academic manner. The collisions between various vocal/mental forces can be described as diffractive intra-actions by which reflection can be made possible only at a second step. Without the diffractive act (the crashing into the unexpected; or if one prefers gently encountering an invisible caress – perhaps by a wind or by someone blowing air into an ear from a distance) no free and/or wild, ornamenting, reflecting act can occur. Like this the performance paper goes on and on. One ornamenting act leading into the next one and the next and the next. Always becoming something more or less, or something different. An endlessly expanding territory spurred by paradoxes and mad ins-and-outs. It all becomes a game between vocality, identity, location and territory, in which all of these have to learn the rules continuously, while at the same time being merged inside fast and irrational acts of truthful engagement. Imagine yourself laying down on a bed placed in the middle of an empty hall in a 17th century palace. High above your face an amazing painting attracts your full attention. A fresco about forty by twenty meters in size. Enormous, amazing and wondrous. The image is overwhelming and seducing. Your eyes travel from one end to another. Searching to understand. To see and to grasp whatever might be of importance the gaze touches a particular detail. This moment is not at all a single unit. Rather, it is a moment incorporating passage, learning, seeing, sensing, losing, embracing; desiring whatever form that might appear within the specific detail. The following text has been ’painted’ with a similar technique as the fresco in the ceiling above your face (presuming you are still laying down). Words are shaped for a certain reason; melting into a surface sustained by air and presence of every kind. Simple words at first making impressions of extreme beauty, disgust, or vulgarity. At a second and third look the same words become intriguing details, coloured with a specific intent, a specific emotional state of being, a specific strength in unique colours. As a viewer you might try to take it all in. But you may see the impossible task above you. You can see and not-see. You can hear how something speaks to you from structures. You may try to penetrate a detail. Even if I don’t know what you might hear, I am sure a clear message will come to you. It might be ”Wow! This is no good”. Or perhaps you have passed through the image/text already a long time ago having seen something completely different. Something that is far, far away from what the image actually is about. Yet, you would never have thought or seen what you see, without penetrating the image above you. Going through. Entering. Or becoming part of. But somehow there is a difference because of the painting. Its colours and its layers of symbols scattered above you matter due to being part of something much more complex while at the same time through such a simplistic appearance. This text is a fragment in a painting. Or even multiple scattered fragments. Multiple voices singing loud or whispering through their teeth. Expositions of something ridiculously simple and naive. But while you keep moving deeper, each sentence clearly becomes more complex than the experience you met at the beginning. Every word is coupled with movements being part of the film (exposed in the Research Catalogue www.researchcatalogue.net/view/210543/210544 if you have decided to go there); with the walls of the great hall; with the windows still so beautiful with its old mouth blown glass. These are details. Encounters between eyes, hands, bodies, symbols, passions etc. All being part of this unforgettable image in the ceiling high above (you may soon sit up unless you haven’t fallen a sleep by now). Details and fragments – distant but in its honesty always blossoming inside any heart nurtured by desire. When looking at a work – a picture, a text, I am connected with the other’s act of forming a sensation, a fact or a lived experience. These words are all arches or entrances essential to this study. Transporting me to other places. Making me transform from owner to loser. From the one who knows to the one who is lost. And then it goes on like that. Within each one of these arches, a step is taken into an empty page. Form is slowly made visible. (Perhaps this is a description of a method.) No-thing is given. (The fear of stepping into a word that might be inappropriate is always echoing inside me.) Lines and dots on a screen or a paper. A vocal cord is set in motion. But how? By breath? By breath. By air. By an idea. By thinking. By doing. … the text suggests. Is it about the salty tear, falling onto my trousers? Or is it a question about abuse? Has someone been hurt? What does this hurting mean? To me? To the text? To the one who listens? To the audience? To all of us perhaps? Some will of course give up on my words and tell that this can’t go any further. What’s the purpose? That is it. The thing. When desire to be part of ends. It comes to an end. And the net has been broken. The thread has been cut off and that might be just right. Nothing to follow anymore. No life to live. All eager for keeping it for myself. Depending on how flexible I am. Freedom is breathing…. Even if someone will argue it is not. Because there is always at least one opposing argument. It all seems too simple and naive, yet it is in this state of simplicity when a primal expression is born. From the most intimate corners of existence. But somehow this simplicity is complicated by words. Words that take over and create borders between beings. Or maybe everything has to start with this tiny act of simplistic mattering in order to grow into whatever monstrosity possibly be imagined. A zooming out into the universal chaos. As a singer, the act of making liaisons vocally comes naturally. Slurred liaisons. However, these liaisons are accepted in certain circles and dismissed in others. I belong to a circle that used to dismiss. But simultaneously I also belonged to another circle that knew that I-don’t-know-what was configured in the liaisons. In the sliding between notes and sounds. As a way of kissing. Caressing vocally. The question is how do I make a liaison between a kissing vocal ornament and words that kiss you, my reader? I embrace you and I kiss you with my voice. (You might not like it but it can’t be helped. Then it will turn into a battle or nothing at all.) And I tell you that this is my intent. Clearly spoken. You might choose to turn your body away. That is your choice. But while singing I don’t tell you my purpose. I just sing. I don’t say a word that hasn’t been added to the score. Even if layer on top of layer is added by the desire of both giver and receiver. Leaving invisible notes that might be found one day. Don’t be ashamed to be a human being – be proud! What about hating the very ’silly’ notion about touch? As if it was something sacred. Which makes me speak ’silly’ words. A hand I can twist around. Or do I just want to be left alone. Without any thoughts at all…? Knowledge coupling itself with power. Building/bringing it away from/to some/thing/one. Perhaps to be found in a location on-the-edge? Where nothing is truly clear? Along with my wandering mind. “So what is there to say about…” ? This was definitely not a vocal interpretation of Leçons de Ténèbres by Michel Lambert. And it certainly was. But far beyond anything like its source. I would rather say I aimed to perform an ornamenting process based on historical matter and materiality. An intra-formance presenting a layer on top of another layer. Blocks of matter on top of each other. Searching for other ways going about shaping and reshaping. Ornamenting a narrative of thoughts, images and sound above an already ornamented vocal structure. 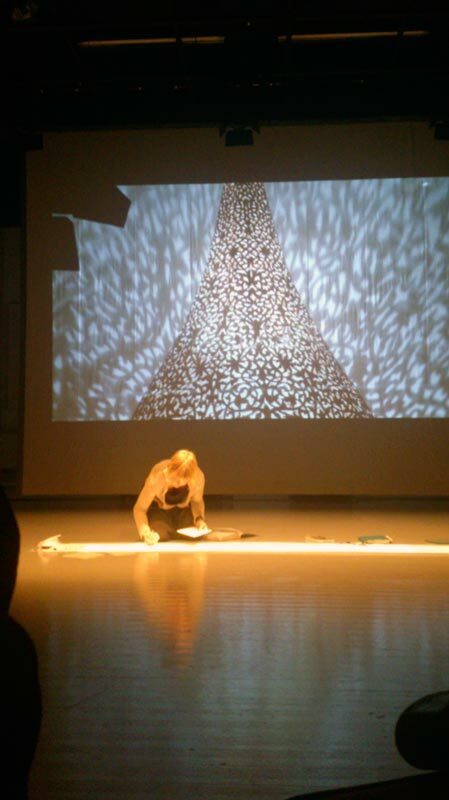 I left Helsinki with a new manuscript – on ornament – created in public as part of this performance-paper. Along with this physical image I also left with a question even more vivid in my mind. How far can one move in search for knowledge and Trust. 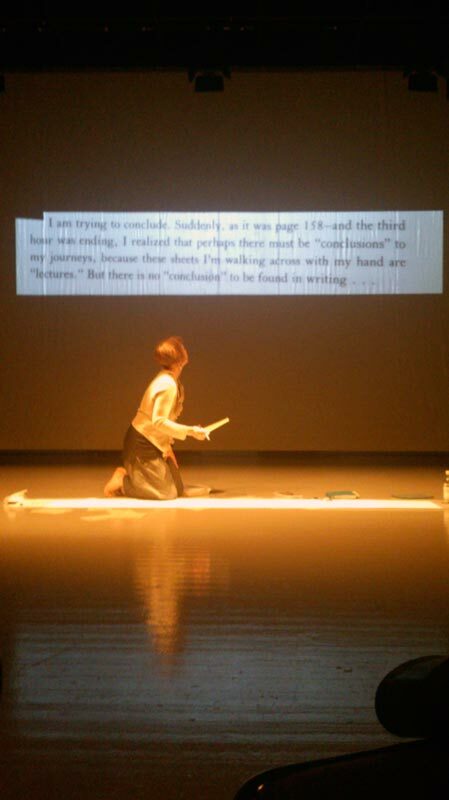 Will the monstrosity and the oddity of a performance / intra-formance like this one be critiqued for its whimsically unclear and muddy messages that perhaps only me – the author/the performer/the artist/the singer – will understand. How strange can a performance-paper simply be within an academic framework? I have no real answer. “And so what?” someone might ask. To this last question. To that I have an answer. I have become an activist. For the purpose of Trust. And with these words I conclude, transform and begin…. 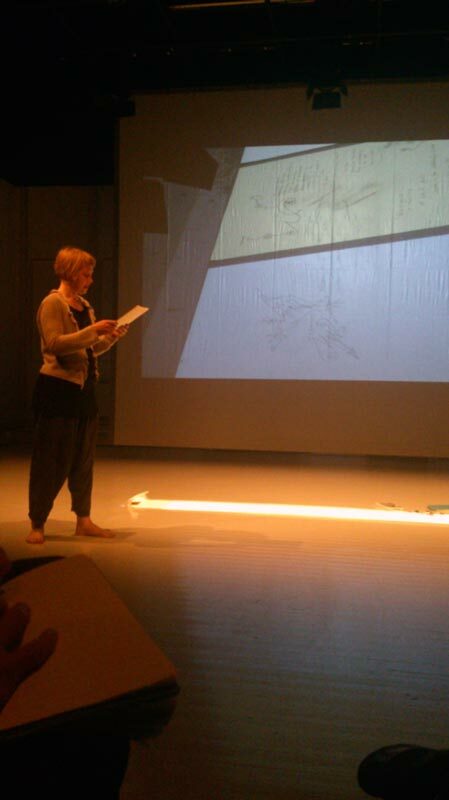 Karen Barad, Andrea Belgrano, Karin Bengmark, Håkan Bengtsson, Benedikte Esperi, Magdalena Górska, Fredric Gunve, Ida Görsch, Tarja Häikiö, Galit Hollinger, Marita Lindmark, Catherine Massip, Frederic Ogéus, Hadass Pal-Yarden, Alexandra Pilakouris, Richard Schechner, Abigail Wood and many more…. Arches, St. Anne’s Church, Jerusalem, 2014. Barad, Karen 2007. Meeting the Universe Halfway. Quantum Physics and the Entanglement of Matter and Meaning, Duke Univ. Press. Barad, Karen 2012. What is the measure of Nothingness? Infinity, Virtuality, Justice, dOCUMENTA (13), 100 Notes-100 Thoughts, no. 99, HatjeCantz, Kassel. Monteverdi, Claudio 1627. In Denis Stevens (transl). 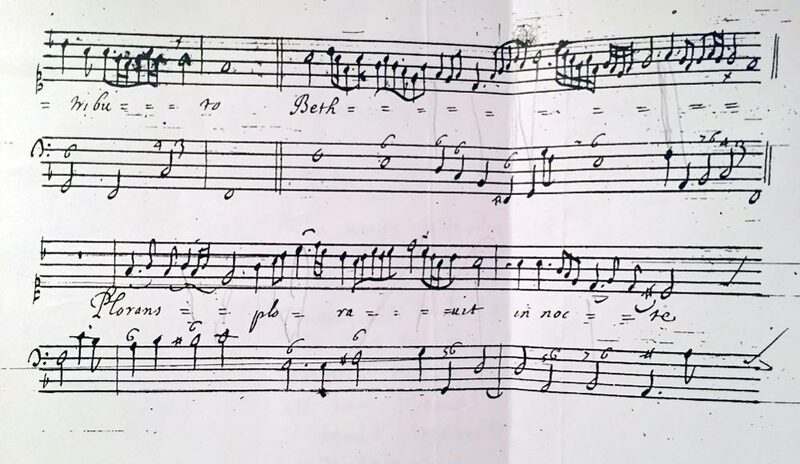 The Letters of Claudio Monteverdi. 1980. Cambridge, p 315. Morton, Timothy 2010. The Ecological Thought. Harvard University Press, Cambridge, Massachusetts, and London, England, paperback edition 2012, p 2. Voices in the Old City of Jerusalem, 2014. Winds blowing at the Mount of Olives, Jerusalem, 2014.